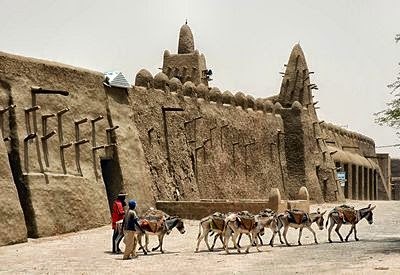 Timbuktu is a word which is often used in several languages to denote a faraway place but in reality it is an actual city in Mali in the African country. It is located at the gateway to the Sahara desert, in the confines of the fertile zone of Sudan near the edge of the Niger River. The legend of Timbuktu as a rich cultural centre spread during the 14th century throughout the world and the beginning of the legend is traced to 1324 when the Emperor of Mali went on his pilgrimage to Mecca through Cairo. It was at Cairo that the merchants and the traders were impressed by the quantity of gold which was carried by the emperor who claimed that the gold was from Timbuktu. Moreover, the great Muslim explorer, Ibn Batuta, in 1354, wrote about his visit to Timbuktu and also about the gold and wealth of that region. Hence Timbuktu came to be recognized as an African El Dorado, a city made of gold. During the 15th century, Timbuktu became very important and produced some of its few goods but served as a major trading centre for salt trade across the desert. Timbuktu also became a centre of Islamic study as well as the home of a university and extensive library. During the 1400s, the maximum population numbered between 50,000 to 100,000 with approximately one quarter of the population comprising of students and scholars. It is a UNESCO World Heritage Site since 1988 and in 1990 was added to the list of world heritage sites of being in danger which was due to the threat of desert sands. A program was then set to preserve the site and it was taken off the list of endangered sites in 2005 but re-added in 2012 after the Islamist Rebels took to arms. The city is a contrast to the rest of the country’s cities due to the fact that it has more of an Arabic flair than the African. Interesting sites to be explored in Timbuktu are the Mosques which remains closed at hours of prayers. Major mosques are closed to non-Muslim visitors as of April 7. There are three main mosques here, the Djingereiber Mosque, which is a world heritage site and probably the largest and the most impressive one. The Sankore Mosque is another impressive minaret which is worth visiting and the Sidi Yehia Mosque. All of which are within walking distance of each other. The Grand Marche, a two storey market with stalls and shops sells all types of things and is worth visiting just to get an incredible view from the roof across the city of Timbuktu to the desert. The original well of Bouctou, which is presently dry, is in some back garden along with the Timbuktu Museum having a mixture of interesting artifacts and contemporary folk art. Timbuktu which has come to symbolize back of beyond remoteness is not an easy place to reach. The drive from the capital of Mali, Bamako, takes around 20 hours which is mostly off road journey. A new airport has now eased the travel to a great extent with several flights now operational to and from Bamako.